There's nothing like a bit of Seal to get me take out the hairbrush mic and give it some in my living room. Still, this post won't be about my lack of singing abilities but about the very pretty rose gardens in Rapperswil. Rapperswil is often referred to as the town of roses (Rosenstadt). Over 15,000 plants of 600 different kinds of roses can be viewed there in the summer. 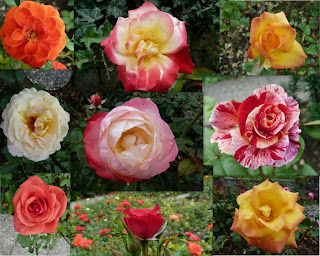 There are several rose gardens tucked away in Rapperswil but the ones we spent the most time in are located near the port within the Capuchin monastery. This particular garden wasn't very big in size but it must have had near a hundred different types of roses and was very sweet-smelling. The gardens were very quiet when we went to visit (may have had something to do with the weather...) and it was lovely to have a walk around and sit down on a bench for a few minutes. Don't you just love the Swiss public water fountains? This one had water coming out of a heron. After the post from yesterday, I can only highly recommend a day trip to Rapperswil if you ever find yourself in Zurich for a few days. You can take the boat to Rapperswil from Zurich (it takes about 2 hours) or a train (it takes about 30 minutes). I now have a new "Happy Place". When I am having a bad day I am going to imagine myself walking through the streets or wandering through the rose gardens.